I am delighted to be here in Nairobi. I thank President Kenyatta the warm welcome and hospitality extended to me and my delegation.I am told, Excellency, that your name “Uhuru” means “Freedom”. In a way, the journey of your life has also been the journey of an Independent Kenya. It is an honour for me to be with you today. • From regular political consultations to defence and security cooperation. India is one of the brightest spot in the world economy. And, Kenya is a land of strong opportunities. India is Kenya’s largest trading partner, and the second largest investor here. But, there is potential to achieve much more. • Expand our investment ties further. The multifaceted development partnership is a key pillar of our bilateral relationship. Our development priorities are more or less aligned.As true and trusted partner, India is ready to share its development experiences and expertise, and concessional credit and capacities to assist in Kenya’s development objectives. We look forward to early implementation of the Indian lines of credit for projects in agricultural mechanization, textiles and the development of the small and medium sector. We are also encouraged by the progress in the power transmission project under an Indian line of credit of 60 million dollars.Kenya’s highly successful geothermal sector, and energy efficiency projects such as LED based smart street lighting, are a couple of new areas where we could build our engagement. I understand that health care is President Uhuru’s key priority. India’s strength, especially in pharmaceuticals, can join hands with your priorities to shape an affordable and efficient healthcare system in Kenya. This would not only meet the needs of your society. It could also help Kenya become a regional medical hub. In this regard, I am happy that the prestigious Kenyatta National Hospital will soon have the state of the art made in India cancer therapy machine – Bhabhatron. We are also donating essential medicines and medical equipment for Kenya’s public health system, including for the treatment AIDS. 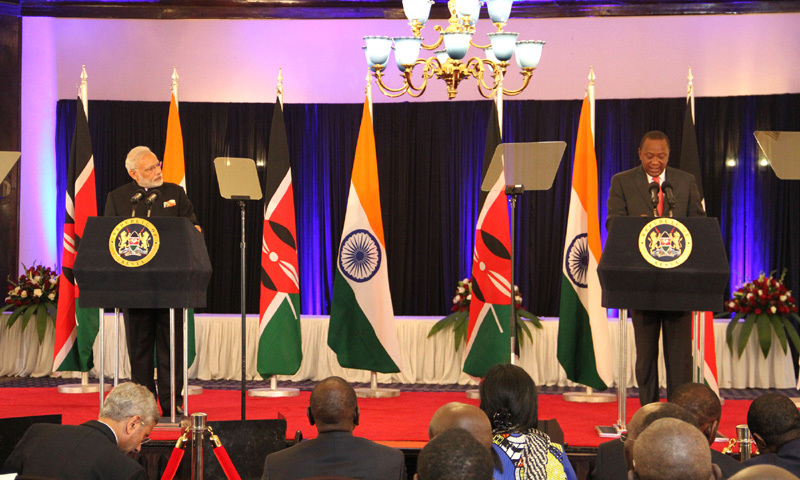 Yesterday, President and I had an unforgettable interaction with the Indian diaspora in Kenya. As President Uhuru said, they are proud Kenyans even as they cherish their Indian roots. As we shape deeper contacts between our economies and societies, they form a trusted bond and a strong bridge. I am also happy to announce that the vibrant Indian culture, which is already a part of Kenya’s rich society, will be showcased in a Festival of India in Kenya later this year.